While navigating the trail between Aspen and Crested Butte is relatively straightforward, the logistics of planning this trip are anything but! As you can read in our guide to the hike, you’ll be faced with many choices from where to park, where to stay, and even which trail to take. You will surely go into the trip with a solid idea of how you plan to tackle this adventure, but keeping an open mind and flexible plans will do wonders to ensure you have a great trip. We ended up having to scrap our parking plans since the overnight lot at Maroon Bells was full. This forced us to start our hike 2 hours later than we had originally planned. However, having some flexibility (and a good understanding of our hiking speed) allowed us to still have a great time and take the parking debacle in stride. We’d highly recommend that you go into your hike from Aspen to Crested Butte with an open mind and the ability to adapt to whatever you find at the trailhead! One of the great things about the hike from Aspen to Crested Butte is that you’ll get to experience an overnight hiking trip without dragging along all of your camping gear. Be sure to embrace this! It will be easy to fill all of that empty space in your backpack with extra clothes, unnecessary gear, and tons of odds and ends that you don’t really need. Resist this urge! Be sure to check out our packing list, and you’ll be glad to be carrying only what you need. To start our trip, we jumped in the car on a Thursday afternoon and headed up to Aspen, camping near the trailhead. This allowed us to hike from Aspen to Crested Butte on Friday, and make our way back on Saturday. This won’t be possible for everyone, but if you can avoid doing this hike on a Saturday/Sunday, you’ll be glad. The crowds can get a bit heavy in the summertime. You’ll have an easier time finding lodging and parking, and you’ll appreciate a less crowded trail. As an added bonus, starting on a Thursday or Friday frees up your Saturday night for a stop on the way home! If you live in the Denver metro area, you probably know that the long drive back from Aspen is a bummer when you have smelly clothes and stiff legs. We stayed in Carbondale after finishing the hike, and boy was it a treat! If you have the time and the funds for it, we highly recommend this worthwhile splurge. You’ll want two essential pieces of footwear for this trip: a good pair of hiking boots and sturdy sandals or water shoes for the stream crossings. For your boots, we recommend heading to your local outdoor shop and trying on as many pairs as they’ll let you. Find the pair that is most comfortable, and be sure to break them in before heading out on this longer hike. For sandals, you’ll want something hardy enough to handle the multiple stream crossings on the trail. We used these Rainbow sandals, but we were definitely jealous of all the hikers sporting Chaco’s, which seemed to give some additional foot support. You’ll be glad you brought good sandals for stream crossings like this one. Sure, you’ll likely be a little sore, tired, and possibly sunburned when you arrive in CB. And yes, you will have to wake up early the next morning to do it all again. But alas, those are not excuses to lay in your hotel room and watch cable TV! The whole point of the trip is to enjoy the town-to-town aspect of the hike. 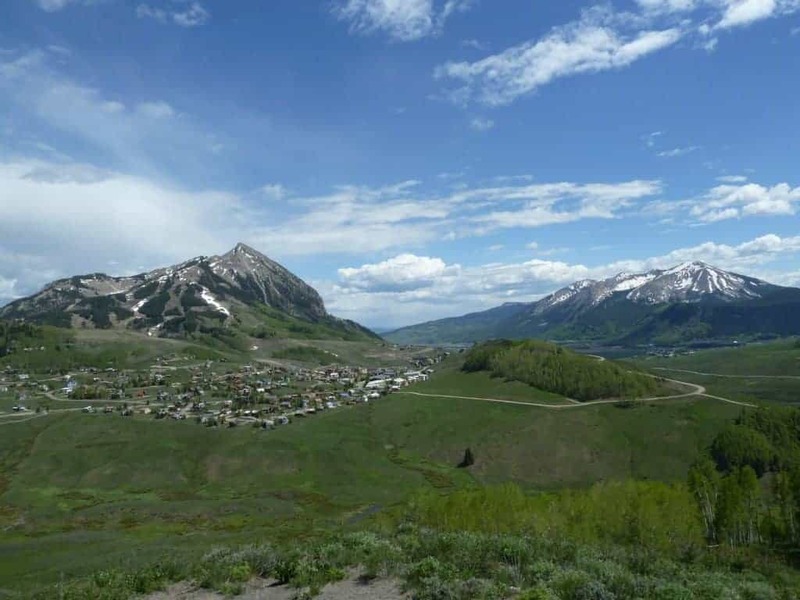 Crested Butte is a lively spot with tons of great food, drink, and entertainment to enjoy. We’re partial to the tasty pizzas and cold pints at the Brick Oven. Top off your dinner with some freshly-made donuts at Niky’s, and you’ll be one happy camper. Vintage school buses provide free transportation around town, so you can rest those tired feet. A night out in Crested Butte is the perfect finish to a fabulous day. No excuses. Be sure to hit the town in beautiful Crested Butte!